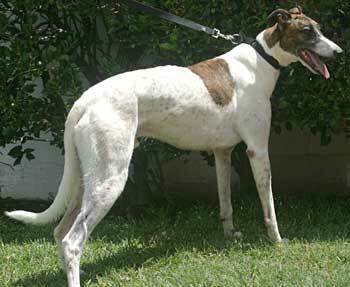 Custer, aka RZ Buster Brown, is a handsome, 3-year-old, white and brindle male born May 1, 2004. Custer's sire is Craigie Whistler, making his grand sire the famous Molotov, and his dam is Rooftop Pinny. Custer is a sibling to Sweetie. Custer raced from March 2006 to March 2007 at Orlando, Florida. Custer is now retired and ready to find his forever couch! He loves, loves, loves to be petted! Custer will do best in a home without small children. Custer's cat test revealed: Custer showed some interest in the cats when he first saw them. His ears went up and he got his nose in for a good sniff. I told him "No Kitty!" and he backed off. Then I got the real cat tester out from under the bed. Molly hissed and swatted his muzzled face a few times. Custer then did not want any more to do with the cats. So I would say that he is cat trainable. 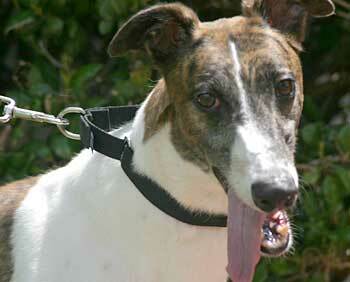 Always remember to introduce them in a safe way and supervise when the cats and greyhound are together. Custer is a very sweet, loving boy. He rides very well, jumping in and sitting down unless you are stopped. He has beautiful coloring and is a cutie. Custer came into my home and immediately wanted to be friends with his two new foster brothers. They weren't too sure about him at first, though, as our previous canine house guests had been much more reserved in the beginning. When I picked him up at the boarding facility where he had been staying, I knew right away that I was going to have my hands full with this boy! When his handler walked him into the lobby, he started dancing about at the end of his leash, then bounced over to the front counter and up on his hind legs he went, with both front paws on the countertop to say hello!!! When I called his name, he whirled around and up he went again with both front paws on my shoulders! I doubt he has ever met a stranger as he seems to love everybody and everything. To say that he has no confidence issues is an understatement! Although Custer is going on 4 years of age, he acts like he's still a pup. This happy tail-wagger is so full of energy and loves to play, play, play! It's evident that he has never lived in a home before because he is curious about EVERYthing, entertaining me with his antics and making me laugh each time he discovers something new. When he first discovered the TV, he ran over to it to check out the woman who was speaking. After sticking his nose against the cold, flat screen, he walked around behind it to inspect her from a different angle and seemed confused that he couldn't see her from that side. He has definitely had some experience with stuffies, though, because he knew right off how to make them squeak. One of his favorite things to do is to toss a toy up in the air and try to catch it. He also carries his favorites into his crate with him. He was interested in the feline residents at first but I firmly told him "No kitties!" and he has not tried to bother any of them since then. He watches them curiously sometimes but has never shown any signs of aggression. Likewise, when he first spied the two tiny Chihuahuas in the yard next door, he ran to the fence, anxious to find out what kind of creatures they could be, but when they started whining and wagging their little tails, he decided they were okay and that they might be good neighbors. Custer is somewhat a Velcro dog, wanting to be with me wherever I go. Sometimes he follows me down the hall to the office, bedroom, or bathroom and gives me a little "goose" with his nose! I was quite startled the first time it happened because I didn't even know he was behind me! When we prepare to go for a walk, he gets overwhelmed with excitement as I retrieve the leashes from the rack, wriggling his way in between his foster brothers to be the first in line. He is well-behaved on leash, even when I walk all three boys together. He has been eating well, has displayed no signs of food aggression, and has slept through the night on a dog bed in my bedroom since his first night here. He has not attempted to get on any of the furniture and, surprisingly, has not tried to surf the kitchen counter even when I left a full pizza box on it. I have not introduced him to children yet, but I believe that he would enjoy having an older child to romp with in the backyard. He might even make a good candidate for agility training. Anyone desiring a more active greyhound will get along beautifully with Custer and will be fortunate to have such a loyal and happy companion.